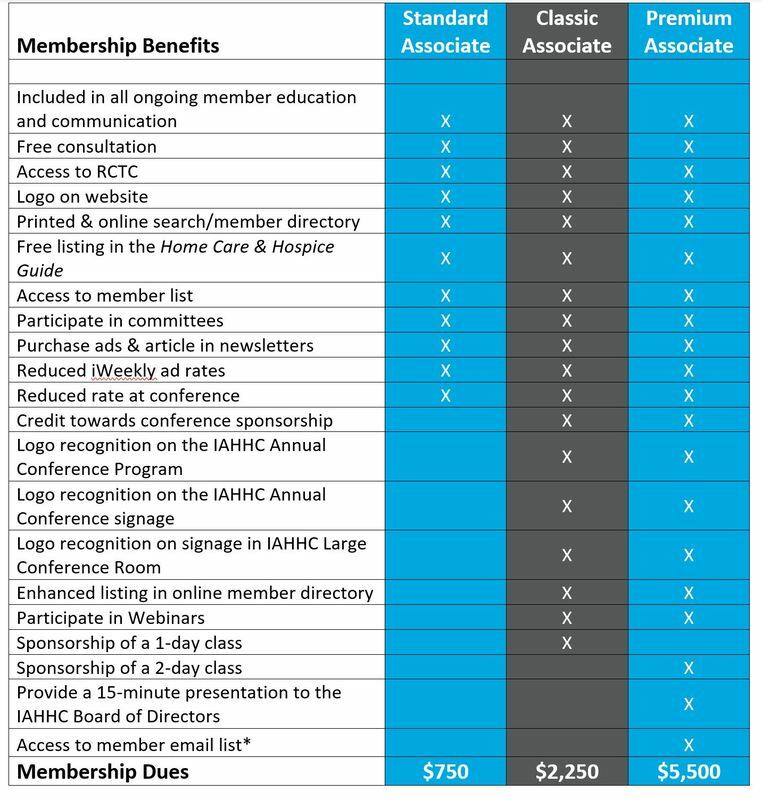 IAHHC offers three levels of Associate Memberships. IAHHC currently has over 55 Associate Members who support home care and hospice throughout Indiana. Below is a chart of the available membership levels. Click here to download the chart. An Associate Vendor Member is a business that supplies goods and/or services for compensation to home care, personal service and hospice agencies, or their patients, but does not supply in-home personnel. Associate Vendor Members shall not have voting rights, shall not hold office or serve as an officer or Director of the Corporation nor chair any standing committee of the Corporation. An Associate Affiliate Member is an entity that does not supply in-home personnel and does not supply goods or services for compensation to home care agencies, hospices, or their patients, but is interested in home care. This category includes a non-profit association or community organization. Associate Affiliate Members shall not have voting rights, shall not hold office or serve as an officer or Director of the Corporation nor chair any standing committee of the Corporation. For more information regarding Associate Membership and the various levels, please contact Michelle Stein-Ordonez, Membership Director, at 317.775.6672 or by email.